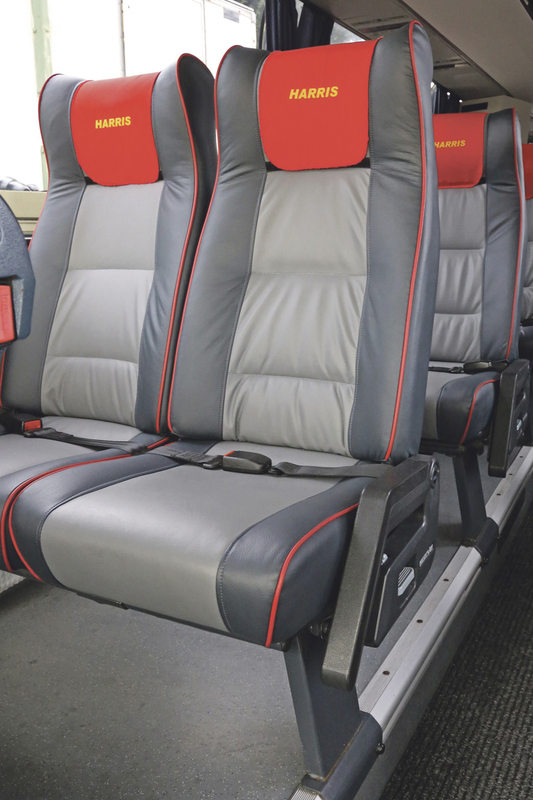 When it came time for the Bromsgrove based operator to refurnish some of its fleet, the company found the leather like material ideal for its needs. 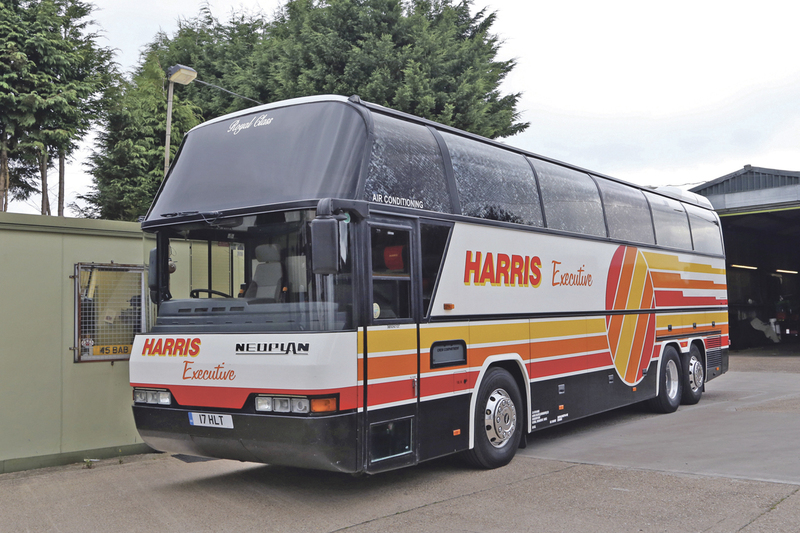 Looking to breathe some new life into one of the company’s well kept Neoplan Cityliners, Jon and Steve Harris of Harris Executive Travel could not decide what moquette to use on the seats. One of the Neoplan Cityliners. Inside the Cityliner reupholstered in E-Leather. ‘Then E-Leather came along,’ Steve said. This leather like material, constructed from real leather, was a game changer for the operator, who had decided to commence the refurbishment programme with the material. Two tone grey has been used on the seats, with red piping to match the branded headrest covers. Unfortunately, over time children pulled this covering off. With the sun now freely able to beat down on the moquette, this led to the seats bleaching dramatically and looking out of place in the otherwise smart vehicle. Steve had the work done at Eastgate Coach Trimmers in Pickering, North Yorkshire. ‘Neil Fowler, Director of Eastgate has really gone to town with updating the vehicle,’ he said. Magazine nets and tables have been replaced on the seats. 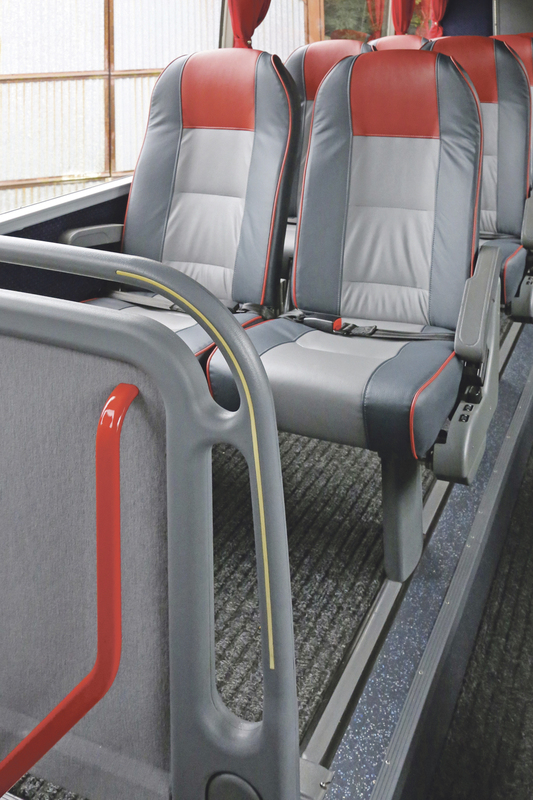 Citing the thorough job that Neil at Eastgate had carried out, Steve explained that he had previously gone to another upholsterer with a Neoplan and did not have a good experience. 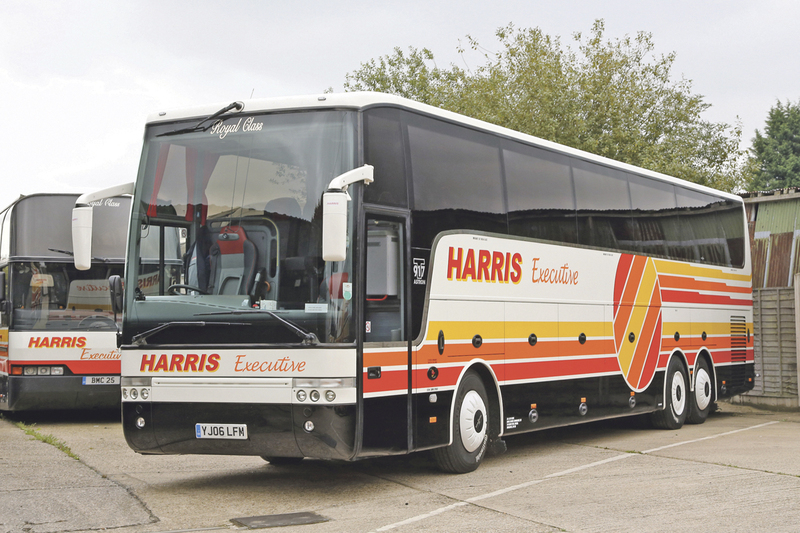 Harris has also had its Van Hool reupholstered in E-Leather. He said E-Leather has grown so much that he does just as much in E-Leather as in real leather these days. 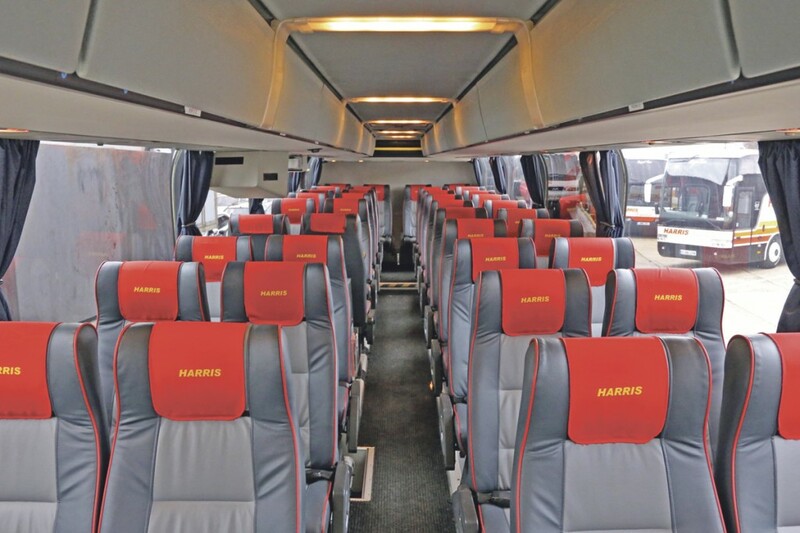 The vehicles Eastgate tends to work on are corporate coaches, where the clients are willing to lavish more money on their vehicles. 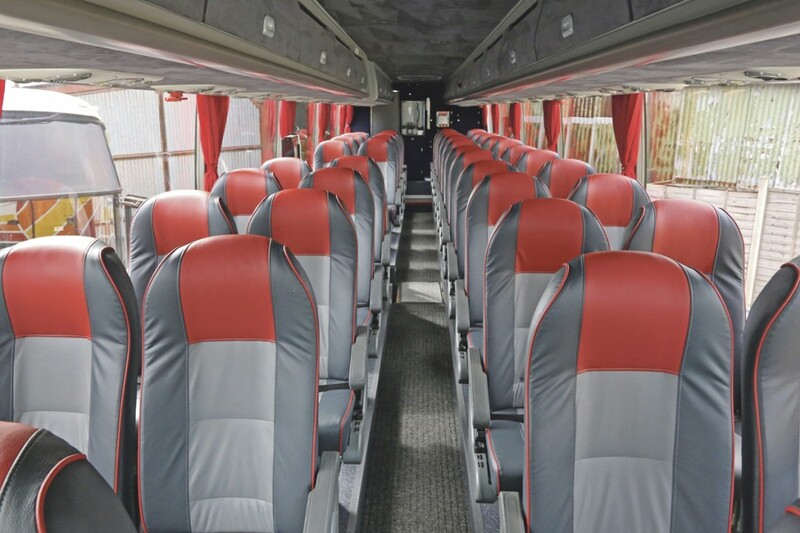 Alpha Powder Coating of Redditch carried out the red powder coating on the handrails of this Van Hool. 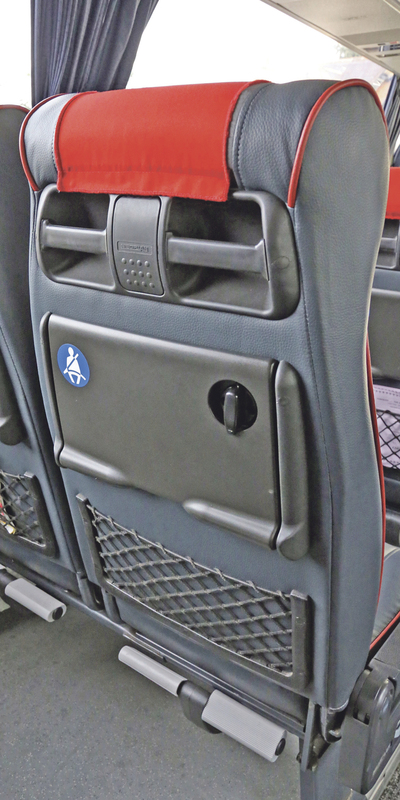 Carl Watkins of E-Leather said the product is proving popular, with Stagecoach, First Group and Arriva ‘pretty much fitting it as standard on new vehicles and refurbishments,’ with Go Ahead using it too. He also reports it is going down well with independent operators, with New Adventure Travel recently becoming a customer for it. 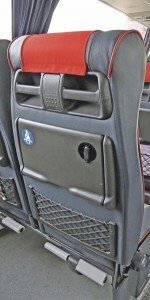 He also noted Nottingham City Transport (NCT) has used it for five years. He acknowledges that it is a ‘fashionable industry’ and as such, the company is starting to come up with different things. For instance, with new Whole Vehicle Type Approval (WVTA) rules coming into effect, there is now a need for even higher fire resistance. E-Leather has developed a product that meets this requirement, the SL9 which it will launch at this year’s Euro Bus Expo. It is not just Steve who is impressed with the E-Leather, he says a lot of the company’s regular passengers are commenting positively on the refreshed vehicles.